The streamlined Sharp Plasmacluster FP-N60CX is by far the best ionizing air purifier on the market today, having a hybrid ionizer-HEPA air filtering system. It utilizes positive and negative charged ions to clean indoor air of odors, VOCs, and lung penetrating particles. It is also very quiet and produces virtually no harmful Ozone gas (unlike most ionic air purifiers). In fact, its the lowest emitter of Ozone from all ionic air cleaners at less than 0.01 parts per million Ozone. The advanced Plasmacluster technology splits water molecules into positively charged hydrogen cations and negatively charged hydroxide or hydroxyl anions (-OH) which are among the strongest oxidants possible. These ions oxidize and thus deactivate indoor air pollutants. This Active filtration capacity via charged ions is what makes the Sharp Plasmacluster FPN60CX one of the best air purifiers on the market today for destroying toxic chemical vapors from paints or household solvents, as well as biological pollutants and bioaerosols. The Sharp Plasmacluster advance air purification system involves over 60 patents pending and has already won many international awards. The break-through hydroxyl radical technology is taking the market by storm and has already left most conventional air purifiers behind. 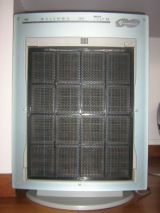 The Plasmacluster is now considered the most effective ionic air purifier on the market today, yet also incorporates true HEPA, pre, and activated carbon filtration - thus making it very effective for chemical vapor, dust, allergen, pollen, and many other impurities that may worsen or cause Sick Building Syndrome (SBS), Multiple Chemical Sensitivity (MCS), lung disease, allergy symptoms, sinusitis, nasal allergies, bronchitis, and asthma. Want a good Allergy Relief Air Purifier? Below is a comparision chart of the best air purifier models of Sharp Plasmacluster purifiers specially designed for the reduction of your allergy symptoms seasonal and otherwise. Room Area Served - 129 sq. ft.
16 1/2" x 16 5/8" x 5 5/16"
Room Area Served - 253 sq. ft.
16 3/8" x 22 1/2" x 7 15/16"
Room Area Served - 330 sq. ft.
16 3/8" x 22 1/2" x 9 7/16"
The Japanese-made new wave of ionizer is unique in its use of both positive and negative ions to clean the air. These free radicals are extremely reactive and like Ozone might have the potential to cause irritation to the respiratory tract. However, It is the highly reactive hydroxyl ions which hold the secret to Sharp Plasmacluster's air cleaning power. This free radical hydroxyl ion air cleaning is safer than Ozone air purification since the hydroxyl radicals quickly decay after emission into the surrounding air. Ozone however may persist for days. The Sharp Plasmacluster FP-N60CX has an extensive electronic user interface with two primary modes of operation as well as some "smart" automatic features. The blue light -(plasmacluster mode) is the more powerful setting and should probably be used only in vacant rooms. The green -(negative ionizer) mode is safe for all rooms, occupied or not; however, it is the weaker mode. The auto and sensitive mode utilizes particle and odor detecting sensors to govern the speed at which the purifier operates. This is truelly 21st century air cleaning technology. Leave it to the Japanese to bring us the wave of the future in ionic air purifiers. In addition to its powerful cleaning ability and miniscule Ozone emission, another feature which makes the Sharp Plasmacluster the top of the line ionic air cleaner is its very low noise level. At its highest setting the FP-N60CX produces only 40 decibals which is unheard of for an air purifier with the published high clean air delivery rates (CADR) that the Sharp FPN60CX is reported to have. Other best of breed features includes the large amount of activated carbon enclosed in its WASHABLE gas-phase filter with claims that it may capture thousands of Volatile Organic Compounds (VOCs) such as those off-gased by many common household chemical products. This ionic air cleaner also contains true HEPA home air purifier filters able to capture at least 99.97% of airborne particles 0.3 microns or larger. A washable pre-filter for larger particles is also included, this helps lengthen the life of the high efficiency HEPA filters and gas filter. The washable activated carbon gas-phase filter and pre-filter are truelly unique and under normal household operation may prevent the need for purchasing replacement filters for up to five years! 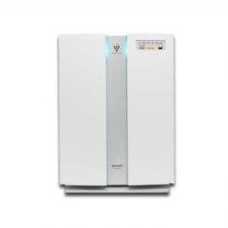 That greatly reduces the cost of ownership of this very effective air purifier. The FPN60CX is also very energy efficient, able to move a large volume of air with minimal power consumption. This also makes it not only effective but cheap to operate as well. In addition to the Sharp Plasmacluster FP-N60CX, several other models are made for various markets. The FP-N40CX air purifier is the mid price point unit made for the American market, the FP-N25CX is the low end price point, and the FP280WM is the Plasmacluster unit that can be mounted on a wall. The Sharp Plasmacluster FPR65CX and FPR45CX are both sold in Canada and the Sharp Plasmacluster FU40SEK is for the British market. 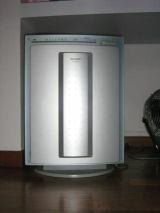 See the above air purifier comparison chart for more specifics on the most popular models of Sharp Plasmacluster purifiers. With the exception of the very effective Plasmacluster purifier, most Ionic Air Purifiers are not very effective and many can even be hazardous to your health. The well known Sharper Image Ionic Breeze air ionizer purifier received a lot of bad publicity because like most air purifier ionizers, it ionized oxygen gas into toxic Ozone gas which is an inhalation hazard. Sharper Image is now bankrupt. You should avoid any of the so-called Ozone Air Cleaners. Ozone is good up high in the Stratosphere, but it is bad down below as Ground Level Ozone and a culprit of smog formation. You do not want to breathe Ozone gas inside your home because it can damage your respiratory system. There is another award winning air purifier that like Sharp's Plasmacluster Ionizers is certified ozone free, has true HEPA filter technology, pre-filtration, and gas-phase filtration with gauranteed and certified test results. Have a look at IQ Air - makers of the best of the best air purifiers. IQAir purifiers are hands down the Ferrari of air cleaners. I've shopped around for the best deals on Sharp Plasmacluster air purifiers and I've noticed Amazon.com usually has the best prices. You can find some especially good bargains around the holidays and if you sign up for Amazon Prime you can get free 2-day shipping too. So be sure and check Amazon.com, they currently have some great deals on the Plasmacluster models.